Numerous new products from the easy dot® and easy fix ranges, high-end laminators and laminating machines “Made by Neschen” and a trade fair concept that perfectly showcases the unlimited possibilities of digital printing: These are the highlights of this year’s FESPA presentation of NESCHEN Coating, a leading company for modern self-adhesive products and high-quality coated media, and its trading subsidiary FILMOLUX-Group at the FESPA Global Print Expo. FESPA is the world’s most important trade fair for digital and textile printing which this year takes place from 15 to 18 May in Berlin. “As every year, FESPA is the absolute highlight in the trade fair calendar of NESCHEN and FILMOLUX. Both brands will again present numerous new products and innovations at the FESPA in Berlin”, comments Kai Tittgemeyer, Managing Director of NESCHEN Coating GmbH. With their trade fair concept “THE HOTEL”, a trade fair stand based on a modern boutique hotel, NESCHEN and FILMOLUX are tie in with their trade fair appearance at FESPA 2017, where they had created a complete shopping mall. Easy application and residue-free removal of self-adhesive films has always been a focus of NESCHEN’s research and development at the headquarters in Bückeburg. At FESPA, we will therefore once again be presenting various new products from the globally successful easy dot® series. NESCHEN solvoprint® easy dot® 180 celebrates a world premiere. Thanks to the dot-shaped dispersion adhesive, the film can also be glued quickly and bubble-free by non-professionals. At the same time, the 180 µm thick monomeric vinyl film is absolutely opaque. This prevents the substrate from shining through unintentionally. Colour accents are achieved with the new 100 µm colour films solvoprint easy dot® in red, blue, yellow, green and black. The new easy dot chalkboard films white and green will provide functionality at the NESCHEN stand. The printable film can be labeled with both blackboard chalk and liquid chalk. The international success story of our wallpaper range will continue in Berlin. The new NESCHEN L-UV Wallpaper is an in-house manufactured wallpaper specially designed for latex and UV printing. 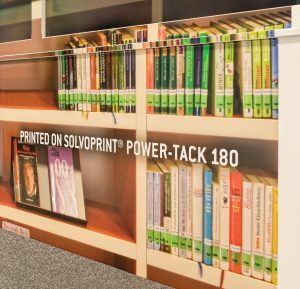 An alternative for demanding surfaces such as polypropylene (PP) or polyethylene is Solvoprint® power-tack 180. It is coated with a special, water-based, ageing-resistant, strongly permanently adhesive acrylic adhesive, which guarantees the medium a secure hold even on low-energy surfaces. High-end laminator technology will also be in the focus again at FESPA. With the Neschen ColdLam 1650, the Neschen HotLam 1650 TH, the HotLam 1650 DoubleH and the EcoLam 1650, NESCHEN Coating now presents four laminators from its own production for every application. The development work at NESCHEN also focuses on the easy and economical operation and maintenance of the hot and cold laminators. Many parts can be easily replaced and repaired by the customer. Training courses and comprehensive after-sales support round off the service. With the ColdLam 1650 NESCHEN presents one of its entry-level models for profile lamination. 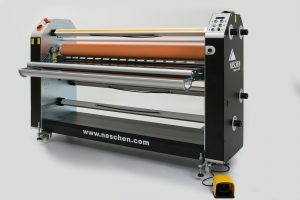 The laminator is suitable for mounting and laminating prints up to a width of 1650 mm. The machine has a heatable upper roller for processing a variety of materials. In the premium segment, the HotLam DoubleH 1650 for professional users will be shown at the trade fair. The machine is characterised by its many possibilities for the most demanding hot shrink-wrappings and a particularly high working speed. The two pairs of main rollers enable the user to change from hot to cold laminations at any time without waiting times. The maximum processing speed is 8 m/min. The creative city of Berlin demands eye-catching and creative trade fair concepts. For this reason, NESCHEN will again present a complete world of experience in Berlin in which print media and functional films will be shown as they are used in the daily business of NESCHEN and FILMOLUX customers. With the “THE HOTEL” trade fair stand concept, a modern boutique hotel will be reconstructed. Visitors to the trade fair can expect a variety of and sometimes unusual examples of applications of NESCHEN materials in the fast-growing interior design sector. At FESPA 2017 in Hamburg, NESCHEN had already modeled its exhibition stand on an urban shopping mall in order to demonstrate the possibilities of digital print media at the PoS. In order to show all products and services as they are actually used in everyday customer life, NESCHEN Coating GmbH also relies on virtual 3D worlds at the exhibition stand. A tablet PC controls a multimedia screen on which a car dealer showroom, a design loft and a library/museum are made accessible in virtual worlds. In a particularly vivid and creative way, the different application possibilities, impressions and visual effects of the print media and protective films from NESCHEN and FILMOLUX are demonstrated. Guest exhibitors at this year’s NESCHEN stand are SPENNARE Displays and TECOSMART furniture films. Both brands are distributed by the FILMOLUX Group in Europe. Get your free voucher here and visit us at the FESPA from 15 to 18 May 2018 in Berlin, Hall 3.2, Stand A 51.